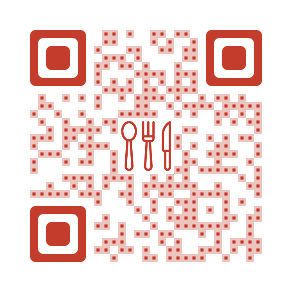 In one of the previous posts, we discussed how QR Codes are being used by restaurants to engage guests in 11 ways. One of the ways was to entertain your guests with mobile browser-based games and challenging them to win a freebie. 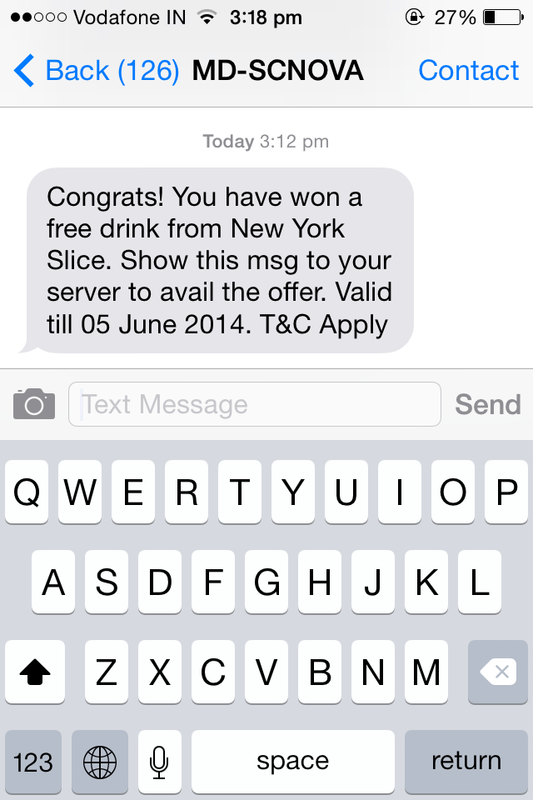 We ran a pilot campaign to test this engagement strategy at a small pizza joint in Hauz Khas Village, New Delhi – New York Slice – for 30 days and the response was quite surprising. Given that this joint has only three tables, a total of 44 unique visitors played a total of 175 games during the pilot. How the campaign benefited the restaurant? A food joint is not just about food anymore. It is about the overall experience of the customer. Majority of the customers at New York Slice are college students and so it becomes even more important to maintain a fun environment. Young consumers – or the millennials – have a short attention span and are bored easily. The waiting time for the food to arrive or the bill to arrive is a crucial time to engage them. This is where the games played a big role. The youngsters are always on their smartphones and the restaurant gave them a chance to win a free drink. It was a win-win. Another great advantage was to leverage this campaign to get contact details of genuine paying customers. According to the restaurant owner, getting Facebook Likes through ads has not really worked for them. They ended up with getting the wrong set of people who did not fall in their target audience. This pilot campaign was a good way to get the contact details of actual paying customers. The restaurant can now reach out to these guests again with offers and promotions. The campaign was designed in such a way that it was possible to track new vs. returning guests who engaged with the campaign. 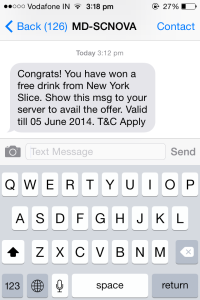 This gave an insight to the restaurant on how effective the campaign was in retaining guests. Another interesting aspect that emerged from this campaign was that the engagement was non-intrusive. The guests could play the game as per their will. Alternate engagement options such as paper feedback forms and live table acts (such as illusions, card tricks) seem intrusive and can make the guests uncomfortable. We created a mobile-optimized group of webpages consisting of a signup page, rules of the game, a simple tic-tac-toe game, and a win page. The guest had to win two games in a row to win the freebie – a free drink in this case. While the campaign went on smoothly, we learnt a few things early on that helped us our increase conversion rate. 1. Give a small incentive to attract your guest’s attention :To get users to engage with our campaign, we offered to give a free drink (a non-alcoholic beverage) with their order. This ensured that the users had a reason to play the game and it gave them a sense of challenge. We also discussed giving out discount coupons and side orders as freebies. 2. 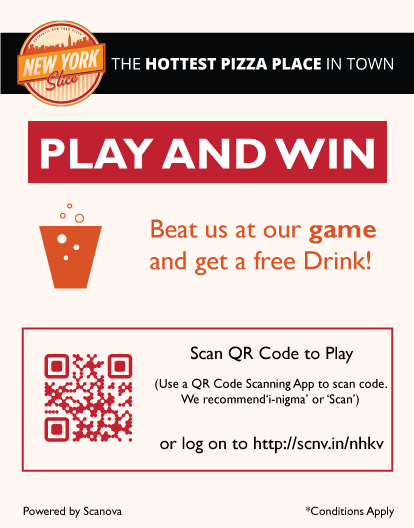 Place a QR Code with the game URL: Nobody likes to type a URL in a web browser even if its a short URL. We added a QR Code to ensure that the guests can easily access the game. 3. Record contact details of your guests: The landing page of the campaign was a simple sign-up page that required the guest to provide her name and phone number. We also added note that the number will be used to send the winning offer by SMS. This was to ensure that guests entered genuine phone numbers. 4. Challenge guests to a simple yet engaging game: We kept a simple game that everyone had knowledge of – Tic Tac Toe. Its quick, engaging, and easy to play. We did not want to keep a game that was difficult to explain in that short span of time. 5. Use SMS/email to send winning offer: As mentioned earlier, once a guest won the challenge the winning coupon was sent via SMS which was valid for that day only. This ensured that the number was genuine. Also the waiter could ensure that the coupon was not used multiple times by looking at the date/time stamp. 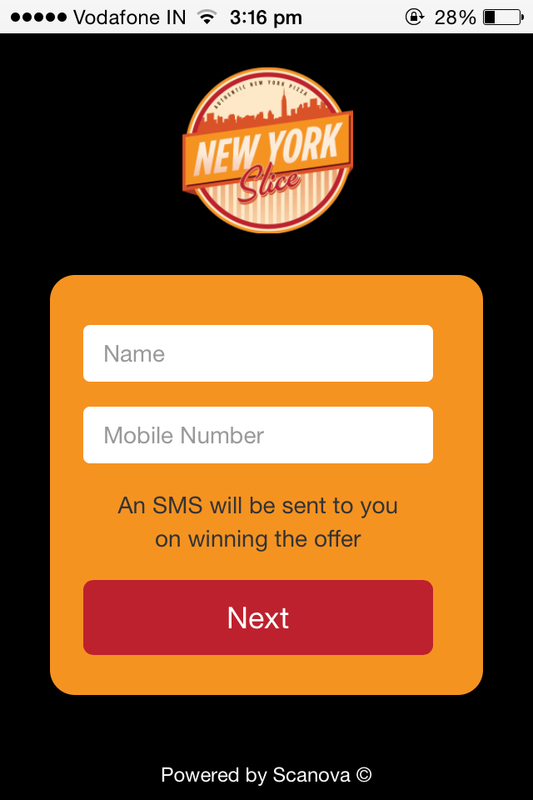 While the entire campaign was custom-designed for New York Slice, it can easily be automated using a DIY mobile page creator and QR Code generator. The campaign can be run at a cost of less than USD 50/month, excluding the cost of the freebies which was less than < USD 1 per winning customer in our case.